Los Angeles Rams claimed Dwayne Gratz on waivers from the Jacksonville Jaguars Tuesday, hoping to add depth at the cornerback position with Trumaine Johnson expected to miss Sunday’s game against the Detroit Lions. Rams coach Jeff Fisher described Gratz as a “great, great young man, really smart, a team guy. Gratz was expected to arrive Wednesday. “We’re get him coached up as quick as we can to play special teams,” Fisher said. Gratz is in his fourth season in the league. He was chosen by the Jaguars in the third round of the 2013 draft with the 64th overall selection.He has played 40 games in the NFL, starting 25. His most recent game was Oct. 2 when Jacksonville defeated Indianapolis, 30-27, in London. The Rams will face the New York Giants in London on Oct. 23. “I didn’t have to ask him if he had a passport or not,” Fisher said. Johnson was injured in Sunday’s 30-19 loss to the Buffalo Bills and is “probably not going to go this week,” Fisher said. “It’ll be week-to-week,” Fisher said. The Rams waived undrafted rookie defensive end Morgan Fox to make room for Gratz on their 53-player active roster. Fox was promoted to the active roster from the practice squad on Saturday when the team needed depth on the defensive line with three starters injured. Fox played on 12 of the Rams 55 plays on defense Sunday, 22 percent, but did not make a tackle. Backers of the proposed extension and increase in a countywide sales tax to fund transit projects pointed Tuesday to the success of the Metro Expo Line, and its heavy use by fans attending Los Angeles Rams games, as an example of transportation improvements the levy would fund. Standing in the shadow of Los Angeles Memorial Coliseum, supporters of Measure M said about 25 percent of people attending Rams games get to the stadium by Metro transit, most notably the Expo Line light rail. Measure M would add another half-cent transportation sales tax in Los Angeles County, on top of the existing half-cent Measure R sales tax already in place. When the Measure R tax expires on July 1, 2039, the Measure M tax would increase to one cent, and remain in place permanently. The measure, if passed by two-thirds of voters, is expected to generate $120 billion over the first 40 years. Opponents of the measure — including the mayors of Norwalk, Beverly Hills and El Segundo, claim the tax would amount to a “blank check” for the Metropolitan Transportation Authority with no accountability. But the supporters who gathered today insisted the measure will result in improvements in communities throughout the county, reducing traffic delay by 15 percent a day while creating 465,000 jobs and funding street repaving and pothole repair throughout the region. Jared Goff threw a 10-yard touchdown pass to running back Malcom Brown with 10 minutes, 30 seconds to play to give the Los Angeles Rams a 21-20 victory over the Kansas City Chiefs in an NFL preseason game Saturday at the Los Angeles Memorial Coliseum. Goff, the first player chosen in the NFL draft, completed all three of his passes on the drive for 34 yards, with Brown rushing twice for 25 yards. The touchdown was the only score Goff produced in his eight possessions, which included kneeling to kill the clock to end both first half and game. Goff completed eight of 12 passes for 82 yards. The Chiefs (0-2) appeared to be driving for the winning score late in the fourth quarter, but third string quarterback Aaron Murray bobbled a snap in shotgun formation, with undrafted rookie safety Jabriel Washington recovering at the Rams’ 22-yard line with 1:49 left. Kansas City regained possession with 1:22 remaining on its 31-yard line, but Murray threw four consecutive incomplete passes. Goff kneeled down twice to kill the final 1:01. There were 80,782 tickets distributed, lower than the record breaking 89,140 tickets issued for the pre-season opening win last week over the Dallas Cowboys. Actual attendance figures are not announced for NFL games, but the crowd appeared smaller. Bicycle patrols around the perimeter of the Coliseum were increased in an attempt to reduce the time for fans to enter the stadium. There was also a different setup at some concession stands in an effort to decrease waiting times, according to Joanna Hunter, who handles corporate communications for the Rams. “ It was a good night,” he said. Back inside the Coliseum, things didn’t go as smoothly on the field. Goff’s first possession ended after two plays when he tripped and fumbled after taking a snap from behind center, with Chiefs defensive tackle Dontari Poe recovering. Cairo Santos kicked a 32-yard field goal four plays later, giving Kansas City a 17-14 lead. The Rams got two first downs on Goff’s second possession, but he fumbled the ball out of bounds on a third-and-four play with Chiefs safety Daniel Sorensen credited with a sack for a seven-yard loss. The third possession was just one play — Goff kneeling for a one-yard loss on the final play of the first half. The Rams were forced to punt after three plays on Goff’s fourth possession. The Rams picked up a first down on the fourth possession on Goff’s 26-yard pass to rookie tight end Temarrick Hemingway, but punted four plays later. The Rams had a total of one first down on Goff’s final three possessions. The Rams (2-0) scored touchdowns on both possessions starter Case Keenum was quarterback. 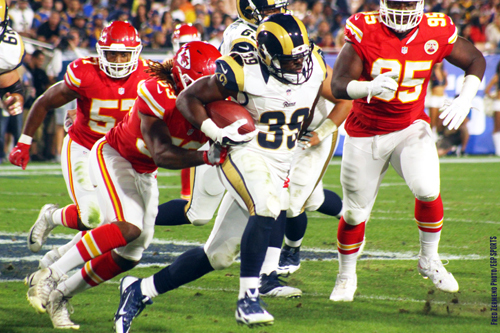 Running back Todd Gurley ran three yards for a touchdown on the Rams first possession, a five-play, 81-yard drive that included a 41-yard pass interference penalty by Kansas City free safety Ron Parker on Rams receiver Kenny Britt. The appearance was the first of the preseason for Gurley, the NFL’s offensive rookie of the year in 2015, who was given last Saturday’s preseason opener off. Keenum threw an 11-yard touchdown pass to rookie receiver Pharoh Cooper on the Rams’ second series, giving them a 14-7 lead. Keenum completed four of five passes for 53 yards. The Chiefs scored two touchdowns and got a 32-yard field goal from Santos in the four possessions starter Alex Smith was at quarterback. Kansas City drove 75 yards on 13 plays on the game’s opening possession, with Smith completing six of seven passes for 65 yards to set up Spencer Ware’s two-yard touchdown run. Smith threw a 20-yard touchdown pass to Jeremy Maclin 10 minutes, eight seconds before halftime, three plays after completing a 37-yard pass to Chris Conley. Nick Foles — released by the Rams July 27 after starting 11 games for the team last season when it was based in St. Louis — replaced Smith with 3:23 left in the first half. Foles drove Kansas City to the Rams 1-yard with 10 seconds remaining in the half when his pass intended for Albert Wilson was incomplete in the end zone. With five seconds left, Chiefs coach Andy Reid opted for a field goal, with Santos’ 19-yarder increasing the lead to 20-14. Foles completed 10 of 13 passes for 56 yards on his first series and 18 of 22 for 133 yards overall. The Rams will be on the road for their next two games, first taking on the 2016 Super Bowl Champion Broncos Saturday in Denver, followed by the Vikings Sept. 1 in Minneapolis. They return to the Coliseum Sept. 18 when they go up against the Seattle Seahawks. The long-awaited return of the NFL to Los Angeles finally came true Saturday night when the Los Angeles Rams beat the Dallas Cowboys 28-24 in the first game in the LA Memorial Coliseum since 1994. Long-starved for NFL play close to home, 89,140 tickets were distributed for Saturday’s game, the most for a preseason game in the United States, according to the NFL. The league does not announce the actual attendance figure. The preseason opener for both teams got off to an inauspicious start for the Rams as Dallas’ Lucky Whitehead returned Greg Zuerlein’s opening kickoff 101 yards for a touchdown. The Cowboys offense scored touchdowns on both of their first two possessions as rookie quarterback Dak Prescott threw 10- and 32-yard touchdown passes to Dez Bryant and Terrance Williams. However, the Rams defense kept Dallas out of the end zone for the rest of the game, with the Cowboys’ only other points coming on Dan Bailey’s 44-yard field goal 3:47 before halftime. Rams starting quarterback Case Keenum played the first three series, guiding the team on a 75-yard, eight-play touchdown drive on their second possession, with Benny Cunningham running the final 14 yards for the score. Quarterback Jared Goff, the first player chosen in the NFL draft, entered the game 9:45 before halftime. His first pass was incomplete and second was intercepted. 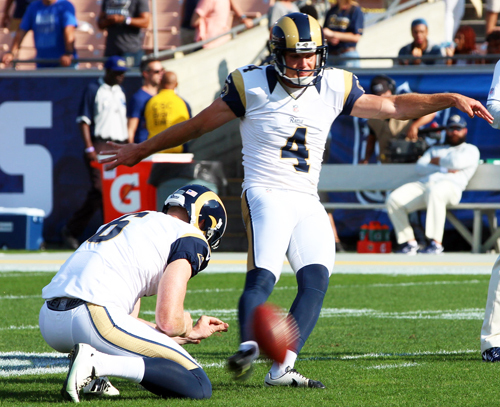 In comes Sean Mannion, who played one game for the Rams last season when they were based in St. Louis after being selected in the third round of the 2015 draft. The third-string quarterback threw three touchdown passes in the second half, including two in the fourth quarter, helping the Los Angeles Rams overcome a 17-point deficit. Both coaches decided not to play their team’s biggest names — Rams running back Todd Gurley and Cowboys quarterback Tony Romo. “There’s always good things that happen in your first preseason game and there’s always so many things that you have to learn from,” Fisher said. On Sunday, the Rams announced that rookie free agent safety Brian Randolph will be sidelined for the remainder of the season because of a torn ACL suffered on a kickoff during the team’s preseason opener Saturday. Rookie free agent and Westlake High School alumnus, receiver Nelson Spruce has a knee sprain and will probably “miss a week or two,” Coach Fisher said. The last time NFL teams played at the Coliseum was on Dec. 24, 1994, when the Los Angeles Raiders lost to the Kansas City Chiefs, 19-9, before a crowd announced at 67,642. The Raiders returned to Oakland in 1995 after playing in Los Angeles for 13 seasons. 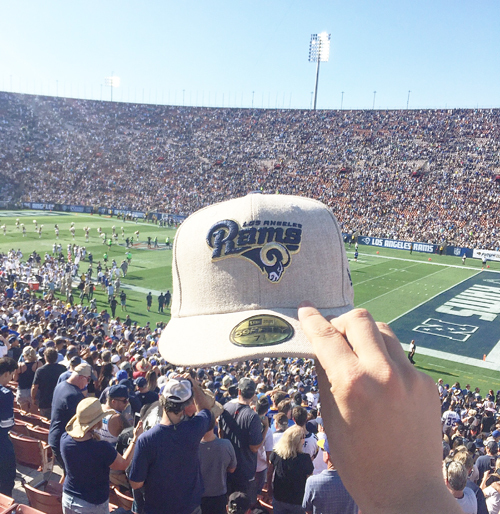 Saturday’s game marked the first time the Rams were the home team at the Coliseum since Dec. 16, 1979, when they lost to the New Orleans Saints, 29-14, before a crowd announced at 53,879. The Rams then defeated the Cowboys and Tampa Bay Buccaneers in road playoff games to reach Super Bowl XIV, which they lost to Pittsburgh in their only Super Bowl appearance during their initial time in Southern California. The Rams played their home games at what is now Angel Stadium from 1980-94 before moving to St. Louis. Rams Coming Back to L.A. The NFL will return to the Southland, with National Football League owners approving plans today for the St. Louis Rams to move to a proposed stadium in Inglewood, with an option for the Chargers to share the facility if the team can’t reach a viable stadium deal in San Diego. The decision, made on a 30-2 vote by league owners in Houston, marks a long-awaited return of the NFL to the Los Angeles area, which hasn’t had a team since 1994. The decision also opens the door for the city and county of San Diego to reopen negotiations with the Chargers to keep them from moving, while giving the team a safety net if such talks break down again. But the deal is also a major snub to the city of Carson, where the Chargers and Raiders had planned to build a $1.7 billion, 72,000-seat stadium. With NFL owners rejecting that option, the Raiders pulled out of the deal, meaning that team will remain in Oakland — at least for now. For Inglewood, however, the decision is a major economic leap forward. Rams owner Stan Kroenke plans to build a $1.86 billion, 80,000-seat stadium to house his team on the site of the former Hollywood Park Racetrack. It’s unclear if the Chargers would actually join the Rams in Inglewood, with Chargers Chairman Dean Spanos repeatedly insisting he was committed to the Carson project, and had no interest in simply being a tenant in a stadium owned by Kroenke. Spanos made his feelings clear on the topic in a letter he sent last month to NFL Commissioner Roger Goodell. Spanos has wanted a replacement for aging Qualcomm Stadium for around 15 years, a quest stymied by the city of San Diego’s fiscal problems of a decade ago, the recession and difficulty in finding a suitable site. When Kroenke proposed about a year ago building a stadium in Inglewood, the Chargers responded by announcing plans to construct their own playing facility in Carson – possibly in concert with the Raiders. The Chargers, who have played in San Diego for 55 years, contend that 25 percent of their business comes from Los Angeles, Orange County and the Inland Empire. San Diego Mayor Kevin Faulconer countered by establishing a task force that recommended building a new facility next to Qualcomm Stadium. The Chargers broke off negotiations on the proposal in June. The team’s refusal to restart talks prevented what could have been a citywide vote on the proposal this month. The Los Angeles Raiders played at Los Angeles Memorial Coliseum from 1982-1994, before returning to Oakland in 1995. The Los Angeles Rams played in the Coliseum from 1946-1979 and at what was then known as Anaheim Stadium from 1980-1994 before moving to St. Louis in 1995.